If you have been following Freebie Finding Mom for any length of time you are already aware of my passion for scoring freebies and saving money. I’m also very passionate about sharing my knowledge with others. With that in mind, every week, I will be sharing one way to save money, as well as keeping a tally of my savings in a savings chart below. This tip will be one that I actually used with my family. My hope is that it will inspire you to actively look for ways to save money in your life. You can also use my savings chart to track your family’s savings! 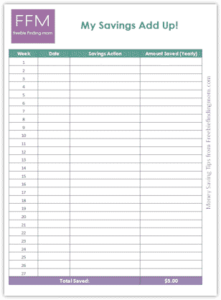 Go ahead, download this free printable savings chart to start recording your own savings. If you are like me, you’ll be super pumped when you start tracking and looking back at your savings to see what you accomplished! It is very appropriate that my first week’s savings chart entry is my home refinancing since I am so crazy proud of this accomplishment! This refinancing has resulted in a $200 monthly savings for my family (that’s $2,400 a year)! Wowza! I have been working on this for months. I called countless banks and credit unions to determine who had the best rate and terms. In fact, I don’t think there’s a financial institution within a 30 mile radius of my home that I didn’t call. Once I determine which bank could offer us the best rate and terms, I thought we were all set. Not so fast, Kelli. The home appraisal came in lower than we needed. Ugh. All I have to say is now I know why people do not want to refinance. Holy ton of work! Rather than bog you down in the minutia of the appraisal appeals process due to incorrect comparison homes and other errors in the appraisal report, let’s just fast forward to the exciting part. We scored the rate and terms I wanted for my family and I could add the savings to my weekly savings chart! This was a super proud moment indeed. Sure I am thrilled I am saving my family big money, but I am also proud that I was relentless about making it happen. This process required tremendous endurance and patience. From dealing with all the back and forth phone calls with banks that often included a babbling toddler in the background trying to take the phone from me while eating my papers. By the way, how do they know it is nap time and to only to return phone calls during that inopportune time? I swear I would get my daily workout sprinting to the phone in hopes I reached before my son woke up. Regardless of the effort involved in making this happen, it was well worth it. What can you do this week to save your family money? It does not have to be as sizeable a sum as this. I likely will not be able to repeat this anytime soon again either. The point is to be proactive, have the mentality of how can I get this cheaper and be relentless about making it happen. That payoff is immensely gratifying, plus it’s fun to use the savings chart to tally up your savings and show your spouse (or anyone for that matter) what a savvy saver you are. So, what are you waiting for? Grab the Freebie Finding Mom Printable Savings Chart and let’s get saving together! See all of my savings chart entries to find out how much our family has saved this year!